While I will forever be #teamneutrals in both my makeup and fashion preferences, I can't help but be drawn to the vibrant colors that are found in summer beauty collections (and clothing - I love a good print!). Stila's newest summer collection is not for the faint of heart, but after playing with it all, I was happy to see that there is a little bit of something for everyone. 1. 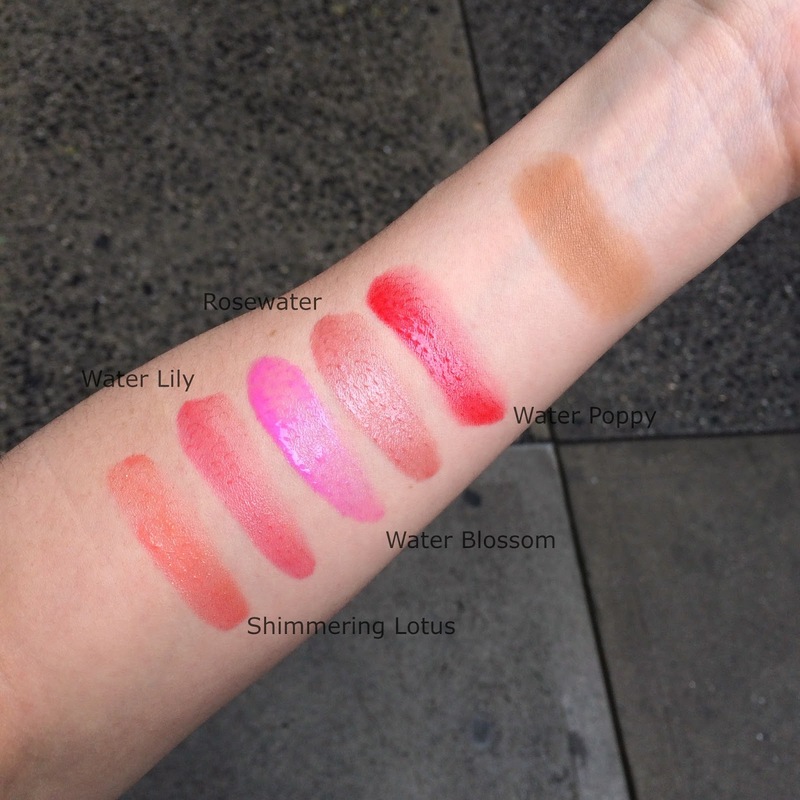 Aqua Glow Watercolor Blush - The swatches may look beautiful in the pictures, but to truly appreciate the beauty of this product you have to physically touch it. It's a mix between a gel and a liquid that applies a sheer wash to the skin or can be built up to give a bolder color payoff. There is a little bouncy netting in the actual pot that helps to keep the product from spilling out everywhere and I find that dipping a sponge, brush or fingers into it once gives enough for a single application. The colors wear all day and disappear into the skin completely giving that nice "flushed from within" look that everyone craves in the summer. And the pigmentation and shade range is perfect for any and every skin tone. 2. All Day Bronzer for Face and Body - There are three shades to this bronzer formulation though I found the light was perfect for me. It is matte with a hint of radiance and applies evenly to the skin. It is not as finely milled as other formulas I have used, but it was the color that won me over with this bronzer. The shade is a yellow-brown which doesn't sound appealing but when on the skin makes my complexion look bright and healthy. 3. Aqua Glow Perfecting Primer - If there is ever a time that you want to put a cooling primer on the face, it is summer. This Aqua primer stick has a gel texture that immediately feels cool on the skin and helps to give a nice burst of hydration. I didn't find that this kept me very matte unfortunately, but for those with dehydrated or drier skin types, this is absolutely the most refreshing product to apply under makeup in the morning. Makeup applied beautifully on top and it made my skin look fresh and smooth. In fact, I don't see this being only a summertime priming option. This would be perfect for the harsh winters up here in NYC when skin needs the most moisture to deal with the frigid temps. Ok, let's not even talk about it - I shiver just thinking about it. 4. Stila Stay All Day Liquid Lipstick - If you have never had the pleasure of owning a Stila Liquid Lipstick, please do me a favor and pick one up immediately. Start with Fiery or Beso for the most perfect red. You won't be disappointed. They are a liquid lipstick formula with a matte finish and last ALL. DAY. LONG. You will most certainly need a cleansing oil to get these off but surprisingly they stay comfortable on the lips despite their intense staying power. There are a few new shade extensions for summer and they are bold, bold, BOLD. 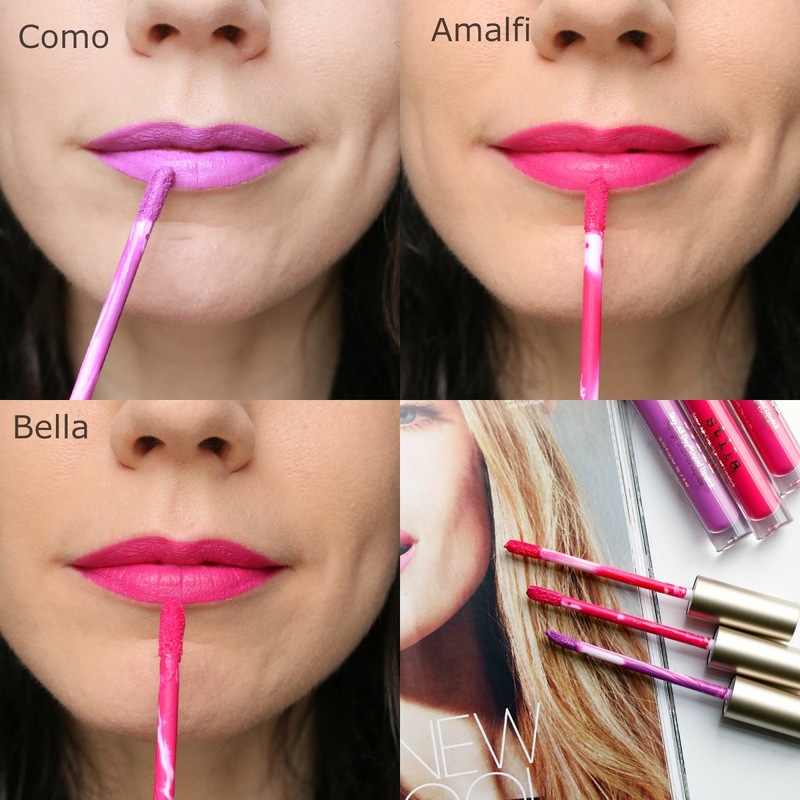 The hot pinks in Bella and Amalfi were naturally my favorites, while the vibrant purple shade called Como is definitely for those that prefer a lip color that makes a statement. It's a bit too out of the box for me, but I can't deny that it feels like velvet on the lips. Argghghh this collection is absolutely stunning! I am so tempted by those blushes, the formula is seriously so unique! I have swatched them in person and the texture is just so damn cool. I love the look of Como as well! The watercolour blushes are beyond stunning! Oooh that bronzer! I'm so obsessed with bronzers right now! I love the look if the watercolour blushes and the bronzer. What an interesting blush concept. Must try! I want to try those blushes soooo bad and they are gorgeous. However I have so many blushes and so little time May have to get one anyway!